The Executive Multidisciplinary Action Projects course spans the entire fourth term of our EMBA Program. This rich project immersion course is a unique feature of the Ross EMBA and one of the highlights of the student experience. You'll work with a team over four months to apply critical thinking to solve a complex issue for a sponsoring organization. We develop our list of projects each year by working with organizations throughout the U.S. and around the globe, building on existing corporate partnerships as well as projects developed in conjunction with EMBA alumni. Sponsors include multinational corporations, small businesses and startups, international incubators, and nongovernmental organizations. Travel is required for some projects but not all. You can choose to participate in either a domestic or international ExecMAP project. If you’re looking to expand your overseas experience, ExecMAP is a great way to do it. In the past, students have traveled to 19 different countries to work with numerous companies, organizations, and governments on high-level issues. By working on a project for 14 weeks, and traveling on-site for roughly a week, you will gain deep knowledge of what it is like to do business in that culture and face specific cross-cultural business challenges. At the conclusion of the project, you'll present your team's analysis and recommendations to both the sponsor and your Ross faculty advisor. 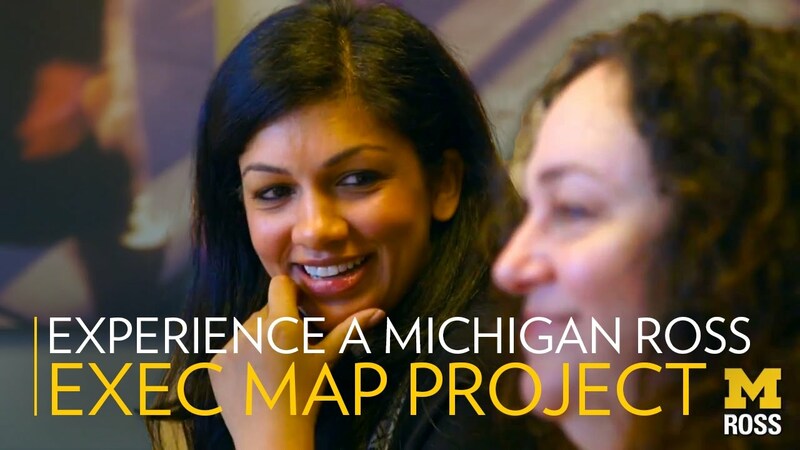 Corporate partners around the world laud the innovation Michigan Ross students and faculty bring to their organizations via ExecMAP. Recent teams have enabled breakthrough science to reach the consumer marketplace, initiated growth opportunities for technology startups, and developed strategies to create jobs for women in war-torn countries. The variety and nature of projects gives you the ideal opportunity to explore a different industry, business function, or country. Through ExecMAP, EMBA students can immerse themselves in a new sector of business, enhance their global business perspective, or discover the world of entrepreneurship. As a student, you also have the opportunity to sponsor a project yourself. By doing this, you can gain the benefits of EMBA ExecMAP consulting on a project at your organization, or you can use ExecMAP to do a feasibility study for a startup idea of your own. Michigan Ross alumni are one of the largest and most passionate alumni groups in the world. Learn more about them and how to connect. When your organization sponsors an Executive Multidisciplinary Action Project (ExecMAP), you get a team of elite Executive MBA students, guided by senior faculty, to tackle your most pressing business challenges.